Through revolutions, wars, economic depressions, riots, military actions, national boom and bust, these two homes, the salt-box style Sydenham House on the 'Old Road to Bloomfield' in the city's Forest Hill section, and the elegant Dutch-influenced Georgian-styled Plume House at Broad and State Streets have survived a total of more than 500 years of Newark and American history. The bronze plaque near the back door of Sydenham House indicates it was constructed circa 1710 by John and Susannah Sydenham and restored by D.J. and Elizabeth Henderson beginning in the 1950s. This makes it the city's oldest residence. For more than 200 years the country-style farmhouse was home to one family. In 1836, the same year the city of Newark was incorporated, it was enlarged to meet the needs of the prosperous and growing Sydenhams. The Historical American Building Survey of the 1930s regarded it as 'a prime example of early American architecture of the salt-box type.' Its walls are sandstone and kept in place without the use of cement or plaster. In 1955, when the Hendersons purchased the building, it was in bad repair, and while the structure's ridgepole remained sturdy, its stone walls had begun to crumble. Its windows were beginning to give way, and a portion of the ground floor had fallen through into the basement. But 30 years of 'sweat equity,' according to Elizabeth Henderson, pulled the old building back to life. Two hundred twenty-six gallons of paint remover, the rebuilding of the exterior walls by a stonemason and the reglazing of every window pane in the house by its loving owners helped save the structure. When proper period furnishings were unavailable to decorate the interior, or were just too expensive, D.J. Henderson crafted them in his own workshop. To insure its future, Sydenham House has been given to the Newark Museum after its present owners and restorers are no longer here; and an endowment fund has been established to ensure its survival. Sydenham House is not only important because of its architectural merits, but may be the first modern restoration undertaken in Newark. The house is also significant since it remains one of the oldest inhabited houses not only in Newark but in the entire region. The Plume House, located on Broad Street, just a few steps from the old DL&W rail line and now the Broad Street Station, represents Newark's other great 18th-century architectural treasure. An exterior bronze plaque on the front of the house placed there by the Sons of the American Revolution states that it was built in 1725. Other sources indicate an even earlier date. 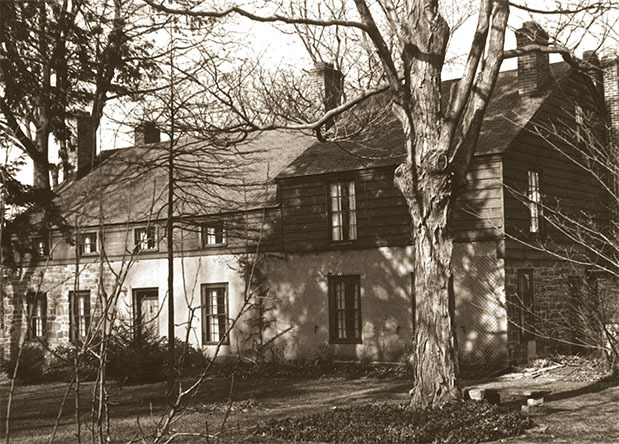 When the Plume House was built, it was on Newark's outskirts and was surrounded by orchards and open fields with an unobstructed view of the Passaic River. Built as a private residence, it became the rectory for the Episcopal House of Prayer in 1850 for a purchase price of $3,500. The fine architectural details clearly illustrate not only the good taste, but the prosperity of the Plume Family. As you pass along the Broad Street front of the building you note the finely cut stone which was quarried in the nearby fields. As you look at the back of the house, note the less elegant rubblestone construction which was more typical of less elaborate buildings of the day. The Dutch-style roof line is a clear indication of the European origins of the builders. The interior woodwork is another example of taste and wealth, and the fine fireplaces were not only useful but decorative as well. As you look at the woodwork, note also the size of the timbers used to construct it. The great trees felled in 18th century Newark and adjoining Essex County no longer exist here. The Plume House is also noteworthy because of its Revolutionary War and 19th century legacies. Mistress Ann Van Wagenen Plume apparently trapped Hessian soldiers in the 18th century ice house, holding them until Continental troops came to the rescue. It was here also that the Rev. Hannibal Goodwin invented movie films while attempting to illustrate his weekly Bible lessons. The invention of film was important not only to Newark but to the world. Because Newark became so industrialized in the last century, it is difficult to imagine that it played an important role in colonial America. But it did, and Newark, as well as the Newark Preservation and Landmarks Committee, is proud to proclaim these great American homes among the city's finest architectural treasures.